After the fall of Mecca, Muhammad performed for the second time since Hijrah, the rite of the Umra, the ritual processions around the Kaaba, and the journeys between Safa and Marwa. But he had not participated in the Hajj. He may have had some idea of depaganizing the Hajj. After the capture of Mecca, in the following Zilhajj, Attab, the governor whom Muhammad had installed in Mecca, conducted the ceremony; both Muslims and pagans took part. The following year, Zilhajj of the year 9 (March-April 631), Muhammad still held back from joining the Hajj. He had not yet finalized his teaching on every detail of the pilgrimage and was unwilling to perform the rites in company with pagans. He sent Abu Bakr to preside over the ceremonies. 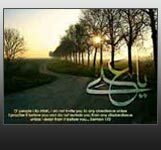 He was overtaken on the way by Ali, who was the bearer of a brand new revelation from Allah which it was his business to see implemented. Pagans generally were to take no further part in the pilgrimage. This was the last year that pagans were permitted to join the Hajj. One year later, in Zilhajj of the year 10 (March 632), the Prophet Muhammad announced that he would personally conduct the ceremony, now that the shrines were purified of all pagan presence. The news spread in the country and an immense number of Muslims gathered in Medina to accompany him to Mecca. Their numbers are estimated at more than 100,000. On the 25th of Zilqad, he left Medina, accompanied by all his wives. He reached Mecca on 5 Zilhajj (3rd March). On 8 Zilhajj, the ceremonies began. All eyes were fixed on the Prophet because his behavior during the rites would become law. "O Muslims! Listen to me with attention. This may be the last occasion when I am with you, and I may not be alive to perform another Hajj. Allah is One and He has no partners. Do not associate anyone or anything with Him. Worship Him, fear Him, obey Him and love Him. Do not miss your mandatory prayers. Observe faithfully the month of fasting. Pay Zakat regularly, and visit the House of Allah whenever you can. Remember that everyone of you is answerable to Allah for everything you do on this earth, and very soon you will find yourselves in His presence. I am abolishing all the customs, practices and traditions of the Times of Ignorance. I disclaim the right of retaliation for the blood of my cousin, Ibn Rabi'a; and I disclaim the interest on the loans given by my uncle, Abbas ibn Abdul Muttalib. I call upon you all to show respect to the honor, life and property of each other in the same manner as you show respect to the sanctity of this day. All believers are brothers of each other. If something belongs to any one of them, it is unlawful for others to take it without his permission. Be sincere in your words and deeds, and be sincere to each other, and remain united at all times. You have rights in regard to women; so also you have duties toward them. Treat them with love, kindness, respect and affection. The slaves you own were also created by Allah. Do not be cruel to them. If they err, forgive them. Give them to eat what you eat and give them to wear the same kind of clothes as you wear. The members of my family are like the pole-star. They will lead to salvation all those who will obey them and follow them. I leave among you a composite heritage – the Book of Allah (The Holy Qur’an) and the members of my family. Both of them are complementary to each other and are inseparable from each other. If you refer to both of them you will never go astray. And remember that I am the last of the Messengers of Allah to mankind. After me there will be no other messenger or messengers of Allah." Muhammad concluded his speech with another short prayer of thanksgiving to his Creator, and called upon Him to be a Witness that he had discharged his duty, had fulfilled his obligations, and had delivered the message of Islam to his people. Many latter-day historians of the East and the West have asserted that the death of the Prophet was sudden and unexpected. But his death was neither sudden nor unexpected. In fact, he was himself the first to speak on the subject, and when the chapter called "An-Nasr" was revealed, little doubt was left in the minds of the principal companions that his earthly ministry was coming to an end. The intimation of death is in the third verse in which he was called upon to "pray for His forgiveness," and the men of perception were quick to get the message. It was during that last pilgrimage that the Surah entitled Succour was revealed, which Muhammad received as an announcement of approaching death. The Farewell Pilgrimage was over, and Muhammad, the Messenger of Allah, along with his followers, were now ready to return to their homes. He gave the signal and the pilgrim caravans began to leave Mecca. The command of Heaven was related to some vitally important matter to which the Apostle had to address himself immediately. He, therefore, ordered his own caravan to halt, and he recalled all those caravans which had either gone ahead or had gone in other directions. He himself waited until the last caravan that left Mecca, also arrived near the well in Khumm. The Apostle had a most important announcement to make before the dispersal of the pilgrims, and he was most anxious that the maximum number of Muslims should hear it from him. A pulpit was improvised with the howdahs of the camels, and the Prophet took his position on it so that everyone in the vast multitude could see him with his own eyes. His cousin, Ali ibn Abu Talib, was standing near him.